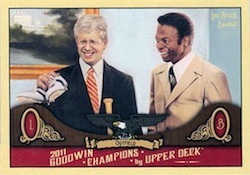 The recently released 2011 Goodwin Champions set from Upper Deck offers collectors a product full of unique cards from a variety of sports. Base card variations have emerged, with Upper Deck releasing specific information on several of them. Another variation centers on a photograph that captures the meeting of Lou Brock and Jimmy Carter. 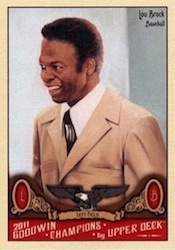 The image of Lou Brock was used for his standard card but the "Reveal Variation" has the image of both the Hall of Famer and the President. The rare card falls one in six cases. Finally, Upper Deck released information and odds on the previously unannounced Sports Royalty autographs. 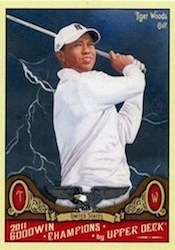 For further reading, we count down our ten favorite 2011 Upper Deck Goodwin Champions autographs in this article. 2011 Upper Deck #1 King Kelly HOF Goodwin Champions W Lightning . Rare. 2011 STEVEN STAMKOS GOODWIN CHAMPIONS AUTOGRAPH AUTO #A-SS TAMPA BAY LIGHTNING! 2011 UD GOODWIN CHAMPIONS MICHAEL JORDAN #23B "LIGHTNING SP* BGS 9.5 GEM MINT!